Peaceful, excited, depressed, uneasy…moods are emotional states that last for a certain period of time. It is natural and healthy to have changes in mood, which are controlled by neural circuits in the brain. Sometimes, however, our moods go beyond the normal range. Prof. Hong Kyung-sue at Samsung Medical Center said in a lecture that the mood disorder is closely related with the biological clock in the body. The most widely known mood disorders are depression and bipolar disorder. In depression, the mood plunges deeper and longer, for no serious reason. Bipolar disorder patients, meanwhile, alternate between “depressive episodes” and “manic episodes.” In depressive episodes, a depression lasts for more than two weeks. Generally, a person has no desire or interest, loses appetite and weight, and has trouble sleeping, while a few of them on contrary sleep too much and eat a lot. One gets anxious, uneasy, tired, and low, feels pain, and become dumb and slow. People around think such individuals are lazy and irresponsible. They experience profound regrets, find negative aspects in everything, become pessimistic, and think that they want to die. During a manic episode, a person has confidence, doesn’t sleep and also doesn’t feel tired. They talk often, become active, and keen. In fact, they are full of ideas and can do many creative things. They sometimes start too many projects, including risky ones, as they become overly optimistic. Such manic episodes, however, are relatively short, and depressive episodes are much longer in people with bipolar disorder, according to Prof. Hong. Then what are the causes of mood disorders such as depression and bipolar disorder? Prof. Hong said that biologically there may be problems in the brain circuit which control the moods. Social environment can also affect us, and stress is another factor. There may be imbalances in neurotransmitters such as dopamine, norepinephrine, and serotonin, the hormones that link the cerebral nerves. Stress such as the loss of a beloved, health, status, honor, or finance, alcohol, drug, or emotional, intellectual or spiritual shocks, and changes in biological rhythms will work as a trigger for such mood disorders, the doctor said. She pointed out that diverse clocks in our bodies are related with the depression. Regarding the circadian rhythm, she said “there is biological clock in the brain. The hypothalamus in the brain makes 24.5 hour cycle. Together with this clock in our bodies, day and night, regular meals, and working hours maintain our biological rhythm,” she said. This circadian rhythm is affected by changes in hormones such as cortisol and melatonin, which is the sleep hormone. “For secretion of melatonin, the light should come into the eyes in the morning. Hence, if you want to sleep well at night after going overseas trip, try to get a lot of sunlight in the morning,” she said. Regarding sleep and wake cycles, there are larks and owls. Prof. Hong said being a lark is healthier. “There is a phase delay in this cycle from the age of 12. You start to go to bed later at night, and this delay reaches a peak at 20. Then the phase moves forward again, and most people return to the lark type when they become old. As you get older, you go to bed early and wake up early.” She pointed out there are definitely more owls than larks among bipolar disorder patients. “It negatively affects bipolar disorder. To pull it forward, you should see the sunshine in the morning so that melatonin will be secreted in the evening,” she said. The biorhythm is also related with season. 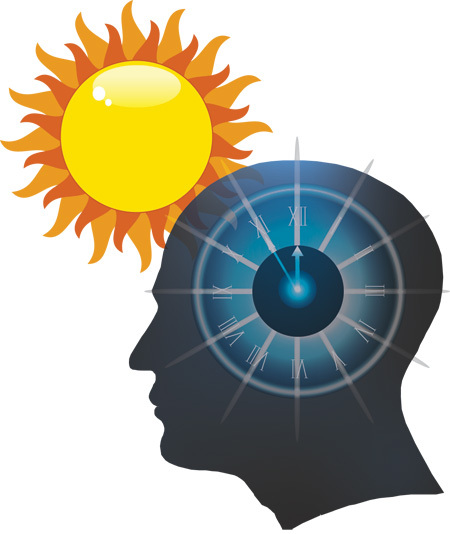 The sun plays a critical role here and depressive episodes are seen more often in winter. She cited the monthly sunshine duration data in Korea, which shows the longest hours of sunshine in May and October, and the shortest in November, December and July, the monsoon season. “Traveling to southern countries in winter may be an option for patients,” she said. Hormones also play a role in biological rhythms. There may be depression at times of hormonal changes, such as the menopause, premenstrual periods, or after childbirth. However, the doctor is more concerned over depression in middle-aged men than women. “While the male hormone is falling, they go through social pressure such as retirement. What is notable is that most of the males refuse to get treatment…Females have heard of menopausal depression and they go to clinic, but males don’t know that they may have depression. They are reluctant to get treatment because they fear they may be stigmatized as a weak person,” she said. However, men consequently have twice the suicidal rate than women, she pointed out. Mild depression in bipolar disorder can be treated with counseling sessions with a psychiatrist, but otherwise it should be treated with medicine, especially in cases when the biological rhythm has been affected, she said. She also recommended “easy and simple,” spending more time on simple activities such as eating, cleaning, taking a walk or talking with a friend on the phone, instead of engaging oneself in serious and important tasks. She stressed being “optimistic and happy,” avoiding bad thoughts or bad news. She said one should determine the priority and give up what should be given up. Also, don’t forget to praise yourself. The doctor stressed regular daily life, taking seven to eight hours sleep, from 11 p.m. to 7 a.m. Avoid napping as it can deter sleeping at night. She stressed that alcohol negatively works on the center of the brain that controls mood. It feels as if alcohol will help sleep, but it only worsens the quality of sleep. “Alcohol should never be used as a sleeping pill,” she said, adding that drinking alone is dangerous. “Drinking alone every day, even if it is a small amount, is worse than overdrinking at social gatherings once a month,” she said. Caffeine, of course, should also be avoided. She added that the rooms should be bright. “You had better get the sun in the morning. Take a walk for around 40 minutes in the morning sun. If that isn’t affordable, you can use a light box. Expose yourself to 10,000 lux light for 30 minutes or an hour in the morning,” she said. [WSJ] How Unhappy are South Koreans?